Dante has written extensively here about the science we hope to accomplish both at Bennu and when we return a sample to the Earth. He and other guest columnists like me have also discussed the design and construction of the OSIRIS-REx spacecraft and its instruments (OCAMS, OLA, OVIRS, OTES, and REXIS). This column introduces another important topic. After launch, just over a year and a half away, we will commence operations. We are in the thick of preparing for our Mission Operations Review (MOR) in June of this year. We will discuss how we will navigate the spacecraft; plan observations; create, test, and uplink commands for the spacecraft and instruments; analyze downlinked data; and make decisions. We refer to all of the groups that perform these tasks as “the ground” — because if it’s not on the spacecraft it’s here, on the ground. NASA and our MOR reviewers hold in high regard the opinions and experience of those who have already flown a mission, successful or not. We too value those who have experience and the lessons we can learn from them. Months ago, we suspected that our best source of “lessons learned” would be found with Rosetta, a mission conceived and executed by the European Space Agency, or ESA. Launched in 2004, Rosetta began its rendezvous with comet 67P/ Churyumov-Gerasimenko just last year. 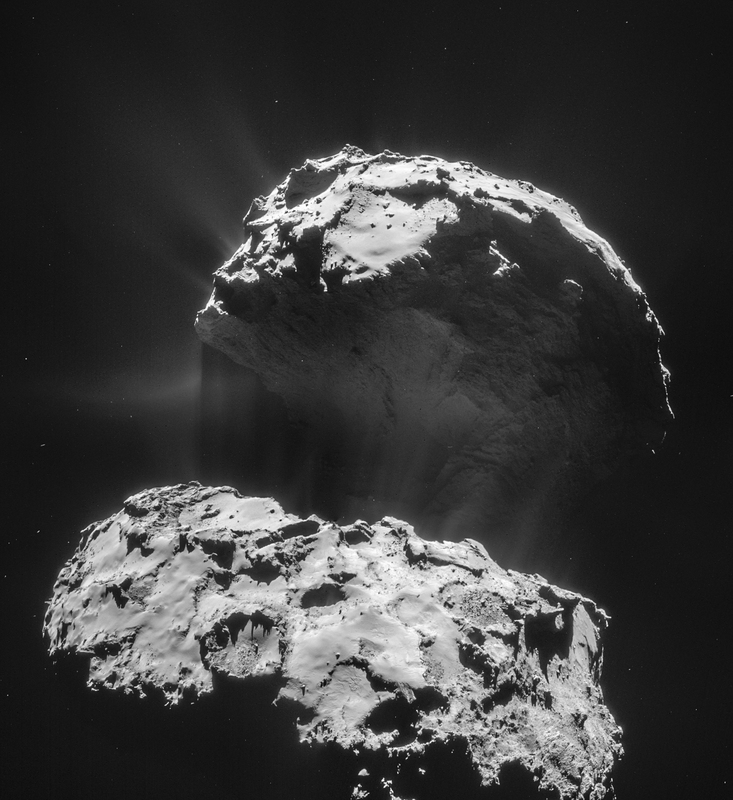 (Rather than repeatedly refer to the comet by its tongue-twisting name, I will simply call it 67P.) Since then, the Rosetta spacecraft has carefully and methodically approached 67P, snapping pictures and taking data. Even with the first high-resolution images, it was clear that the Rosetta team was in for a wild ride. 67P is truly an alien world, a 4.2 km-wide (2.6 mile) solar system body shaped by vaporizing ices and left tattered by its many trips around the Sun. Exploring comets and asteroids has similar challenges — both are small worlds with very weak gravity. Even small bursts from rocket engines can produce big trajectory changes. To avoid a collision, navigators must first get the “feel” of the spacecraft before they get too close. Another important similarity shared by our two missions is site selection. OSIRIS-REx will look for a place to obtain a sample. In the case of Rosetta, they were searching for a place to set down a lander, Philae, where it would report on the conditions at the surface as 67P warmed up during its approach to the Sun. As the world now knows, Philae was successfully released on November 12, 2014. It gently struck the surface of 67P at about 1 meter per second (~2.2 mph) just about 100 meters from its intended landing site. Unfortunately, its anchors failed to deploy, and Philae bounced twice, landing on its side in shadow almost 2 km away! (I said there wasn’t much gravity.) Despite this harrowing ride, Philae managed to return images and other valuable data back to the orbiter for many hours before its battery was depleted. Hope is not lost – engineers expect that Philae may come back to life as the comet gets closer to the Sun and its solar panels are more fully illuminated. At MOR, our review board will have many questions about small-body navigation, site selection, and the decision making driven by daily doses of new information just like the Rosetta team experienced. Seeking their lessons learned after the Philae landing, we wasted little time in arranging a meeting with the Rosetta team. On an earlier trip, we visited ESA’s European Space Operations Center (ESOC) in Darmstadt, Germany. Then, we heard about plans for their encounter with 67P. Now it was time to hear what really happened. 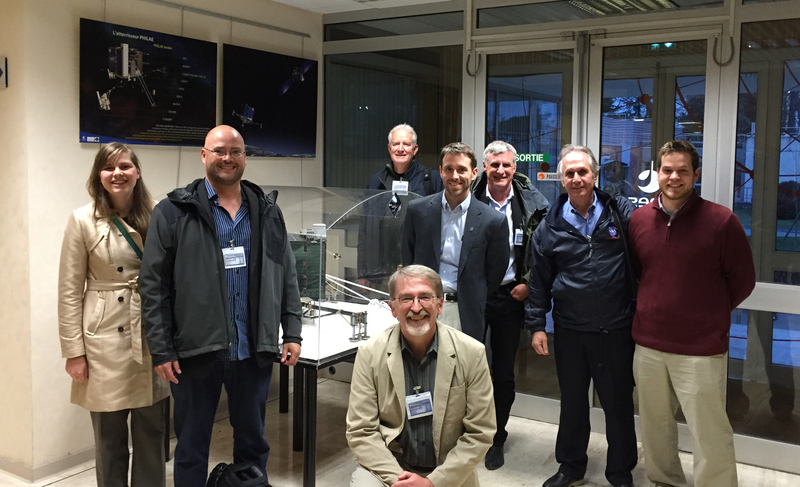 Our first destination was not Germany this time, but Toulouse, France, home of the French space agency CNES, to discuss Philae landing operations. Traveling were members of our own navigation, science, and spacecraft operations teams. Aurelie Moussi, Philae operations lead, arranged briefings on Philae planning and commanding, the site selection process, and the tools used by their team. We heard about how they initially selected five sites, and then quickly narrowed their choice to a final site as new information about the comet was developed. They also demonstrated some of their tools for managing and viewing the data they needed to help them make their selection, and discussed the challenges that the comet’s unexpected and complex shape created in processing and interpreting the data. 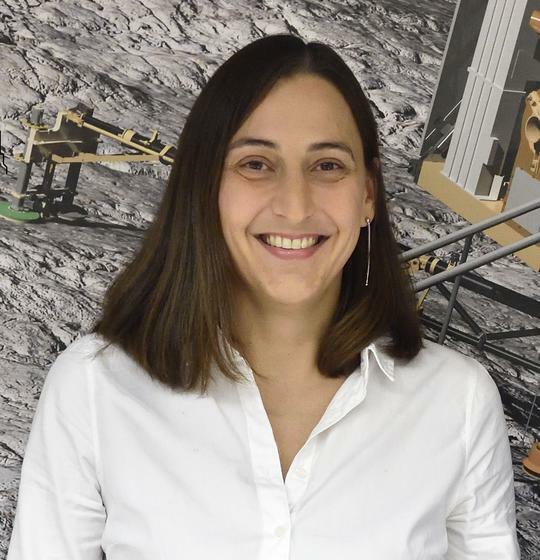 Aurelie Moussi, Philae lander science operations lead hosted the OSIRIS-REx team during their visit to the French space agency, CNES, in Toulouse, France. The next morning, we made the short flight north to Darmstadt, and on the way were treated to a spectacular view of the French Alps. 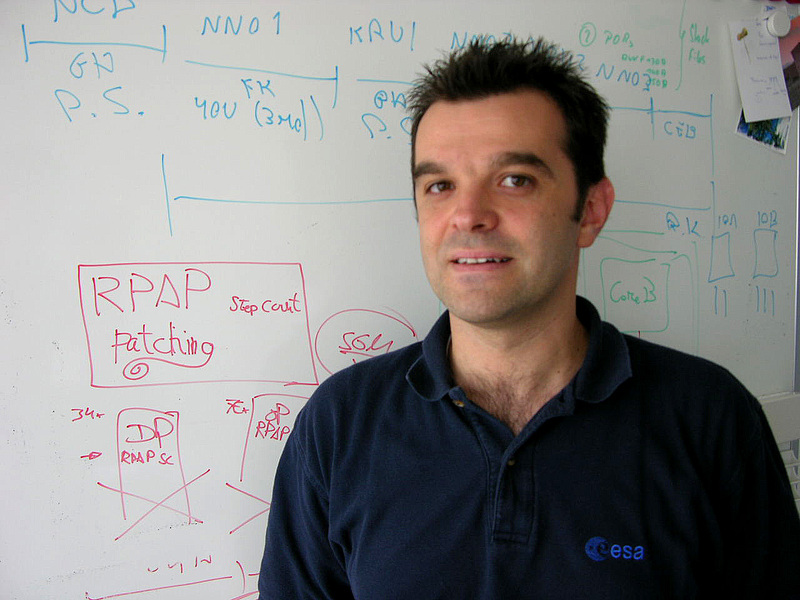 There we were joined by two more members of our navigation team, and were greeted at ESOC by Andrea Accomazzo, who is the project’s Mission Director. ESOC is where operators monitor the condition of Rosetta and command the spacecraft and its instruments. Rosetta navigation also takes place at ESOC and Andrea arranged for us to spend the entire day with members of the Rosetta orbiter operations and NAV teams. We heard about their plans to approach the comet, and how they practiced to improve their navigation skills. We discussed their planning and commanding processes, reviewed their techniques of landmark navigation, discussed maneuver design, and even examined how their work schedule was designed to avoid burnout. At the end of our trip, I was struck at the similarities shared by our missions. We found ourselves agreeing on many approaches to navigation, decision-making, and coping with risk. This was reassuring, and gave me confidence that our own plans are fundamentally sound. But, like anyone who has made the trip before, our colleagues were able to offer up many good ideas that will make our own job easier. I look forward to discussing some of these in future columns as we proceed towards launch and our time at Bennu. I always find these encounters to be very rewarding. Our ESA friends have never failed to give us a warm welcome and to be completely frank in answering our questions. 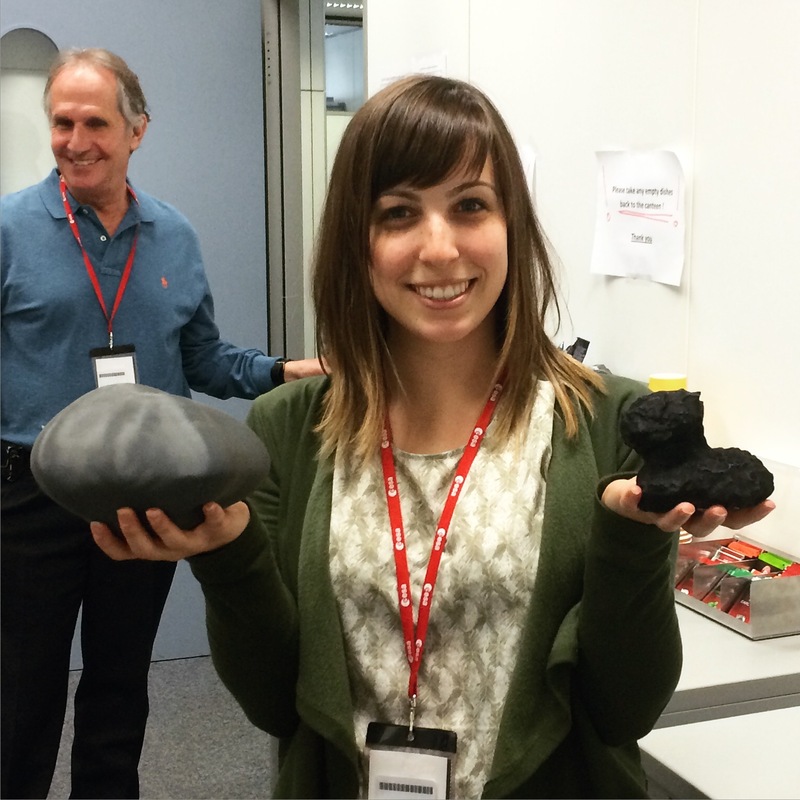 They even presented us with gift – a small model of 67P! Perhaps Andrea Accomazo said it best — “it’s a pleasure to share experiences with people that deeply understand the challenges such an adventure poses.” It’s also nice to know that even on the asteroid frontier, we have good neighbors.